All year, our pup enjoys her little rawhide chews. Keeps her teeth clean and gives her something to do rather than watching what we are cooking. 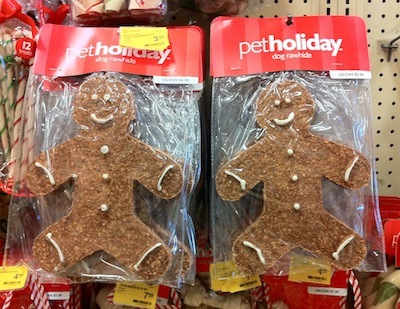 In Petco last weekend, we saw they were discounting their holiday chews and toys. Right up front where these fun rawhide chews… Gingerbread Men!! They are actually pretty big, these would take our pup a long time to work through. The chews don’t go bad just because it isn’t the holiday season, that is only for us. For dogs, they just know it’s a treat year around. Remember this post a month ago? (Where do you start when eating your Gingerbread Man Cookie) I wonder if this is the case with dogs eating their Gingerbread Men too. Ha!